Isaac Olguin, sophomore at Belaire High, participates in a mock interview as through Urban Restoration Enhancement Corporation’s (UREC) College & Career Ready program. Isaac Olguin is a sophomore at Belaire High School. Originally from central Florida, Isaac and his family moved to Slidell, La. where he attended sixth through ninth grade. His family moved to Baton Rouge this school year. For Isaac, that meant a new school, new friends, and new opportunities. One of those opportunities presented itself when a teacher at Belaire, Catina Flowers, encouraged him to enroll in Urban Restoration Enhancement Corporation’s College and Career Ready Program. Mrs. Flowers, whose daughter was already a participant in the program, felt that Isaac was a student with potential and could benefit from the curriculum focused on college and career readiness. Isaac is the second oldest of four siblings. When he graduates in 2019, not only will he be the first in his family to graduate from high school, he will also be the first to attend college.“Being the first in my family to go to college without any help will be difficult, but when my mind is set to something I will succeed at anything,” explained Isaac. Realizing he’d need additional academic support to achieve his dream of going to college, especially in the area of ACT test preparation, he followed Mrs. Flowers’ recommendation and committed to participate in College & Career Ready Program. When Isaac first started the program, his career goal was to become a construction manager. Some of his family members work in construction, and he’d helped them out on a few job sites. Isaac was confident that a construction management degree was his way into this field. However, he began to think differently about his career choice after attending the program’s Young Professionals Panel Presentation. The panel of college students and young professionals shared their experiences of starting out in the workforce, discussing topics such as proper etiquette in the workplace and the importance of establishing oneself as a reliable, competent, and proactive employee. One panelist, a Southern University student and civil engineering major, encouraged Isaac to consider majoring in civil engineering instead of construction management. He advised Isaac to broaden his career options so that he could work on both construction projects and other types of engineering projects. Grateful for the advice, Isaac has now decided to pursue civil engineering. In addition to the Young Professionals Panel, Isaac has benefited from many of the program’s other resources. He learned about the college admissions process and college life from current college students and recent graduates. 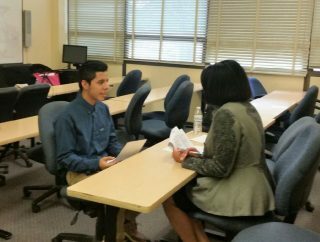 And, Lynnette Lee from the Career Center at the East Baton Rouge Parish Public Library provided a series of workshops with advice on the job search process from writing an effective resume and cover letter to preparing for a job interview. Through a collaboration with the service organization, the Greater Baton Rouge Chapter of the Links, Inc., he also participated in two mock interviews with seasoned business professionals and Links members Helena Cunningham, Founder and CEO of National Housing Consultant Services, and Rose Hudson, President of the Louisiana Lottery. 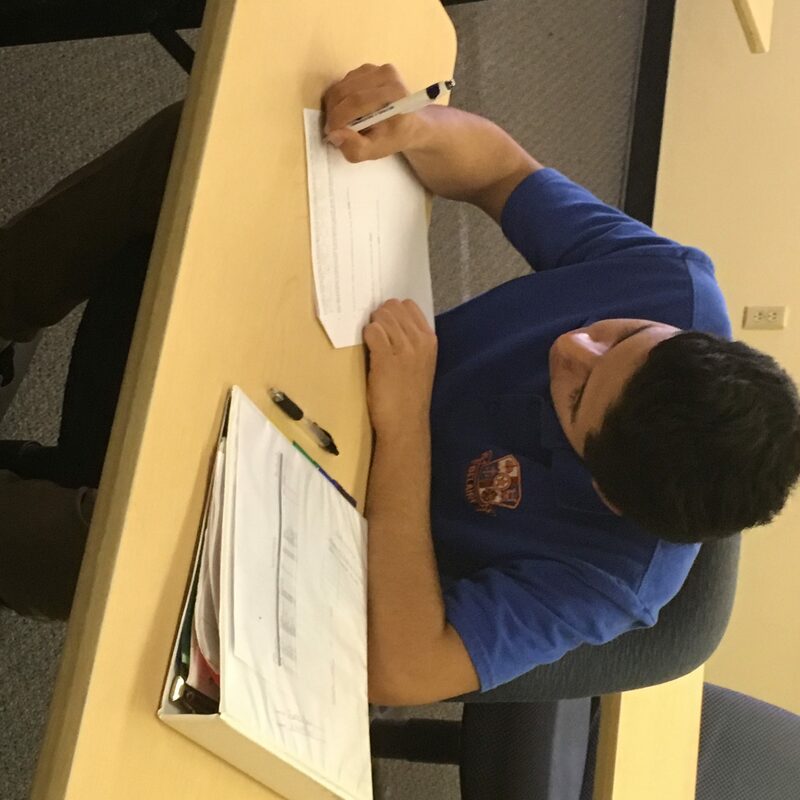 Isaac Olguin prepares a personal essay as a program requirement through UREC’s College & Career Ready program. Still, it was the Personal Essay Writing workshop series facilitated by Nayita Wilson, Founder and CEO of NVisions Communications & Consulting, that resonated with him most. In those workshops, Isaac learned the art of writing a stand-out essay for college admissions counselors and scholarship committees.